The company was first set up as a fun project in 2006, but then the great success of the first series of boards pushed this project further. Since their start, Close Up invents and improves miniature skateboards and reduced parks like the turntable skatepark and other small street spots. The idea behind is to create a miniature of the reality and to provide the most complete professional fingerskate set ever! Close up boards are not made of plastic like usual fingerboards. Three wooden plies (+2 thin ones) are getting pasted and pressed together like a real board. 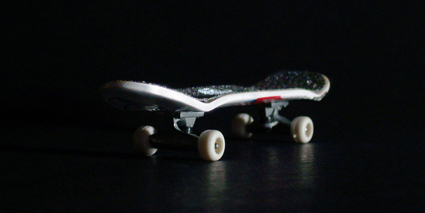 The boards, trucks and wheels are at the scale 1:11, with realistic nose and tail and a deep concave. The grip is the same as a real skateboard grip tape, but smoother, as it would not cut your fingers. Because of the small size it’s impossible to produce bearings, this for, screw nuts replace this really important element and the boards are rolling pretty well! The skateboards are coming with a special set of scaled Carhartt stickers, a finger skate-tool and all the single parts of the skateboard. The instructions make the set-up easy, even if it´s your first time with a finger skateboard. and through the Close Up network and website.